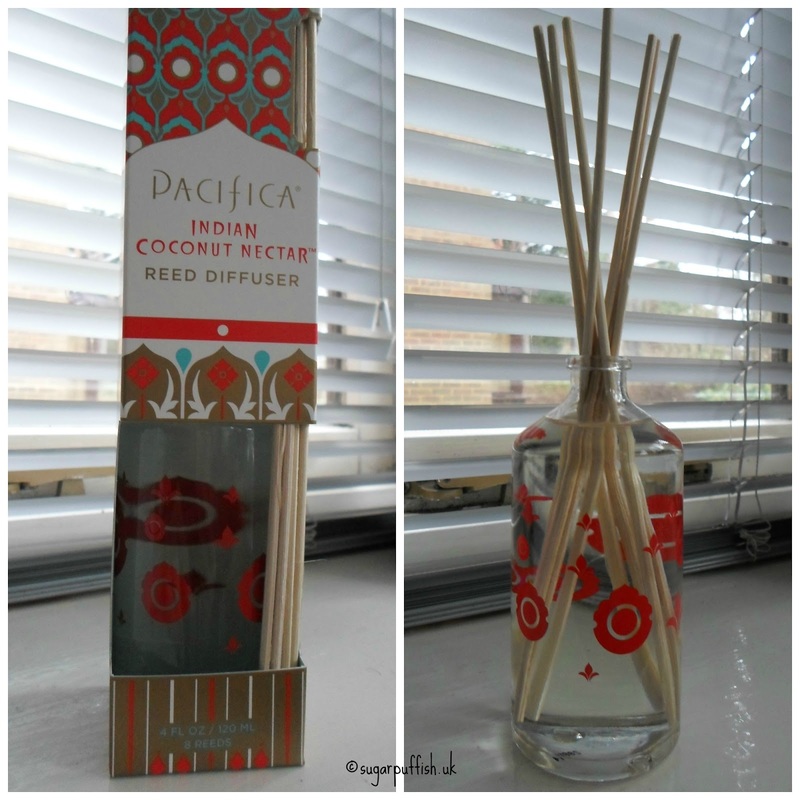 I wanted to write about a new reed diffuser I bought a few weeks ago. You may have seen me mention it in my haul video but it’s from Pacifica in the scent Indian Coconut Nectar. Pacifica is a U.S brand and their products are Vegan and promise (on their website) that they never test on animals or use animal derived ingredients. Reed diffusers are my preferred method of bringing fragrance into my home. I find mainstream room sprays give me a tight chest but no surprises there considering the type of ingredients in them. I definitely do not have the same problems when I use essential oil based scents. I am unable to give you an ingredients list for the Pacifica diffuser because they do not disclose this information. They are within their rights to do this because perfume is protected under trade secret laws. All I can tell you is the packaging states the fragrance is a blend of natural and essential oils and free of phthalates. Indian Coconut Nectar is described as “warm, sultry blend of coconut and delicate creamy vanilla” and I would agree with this. It’s sweet and sugary which matches my personal taste. The packaging can be recycled and I like the cute decoration on the glass bottle. I am happy with the level of scent the diffuser releases, it is not overpowering and if I ever feel like it’s disappeared I simply rotate the reeds. Pacifica claims the diffuser will last six months and if that happens I will be very impressed. So far so good as the bottle still looks full and I mention this because my last diffuser seemed to evaporate in a few weeks. Have you tried any products from Pacifica? If you use their perfumes do you have a favourite scent?